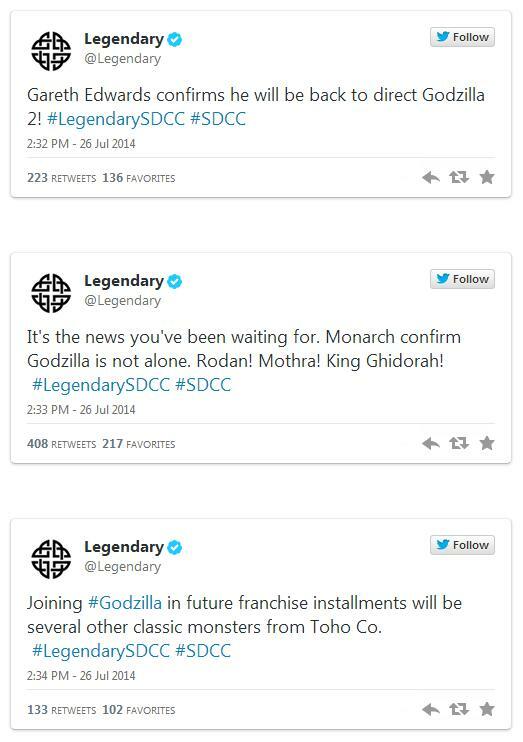 Straight From SDCC: Legendary Confirms Mothra, Rodan, and King Ghidorah for GODZILLA Sequels! – SKREEONK! Straight From SDCC: Legendary Confirms Mothra, Rodan, and King Ghidorah for GODZILLA Sequels! 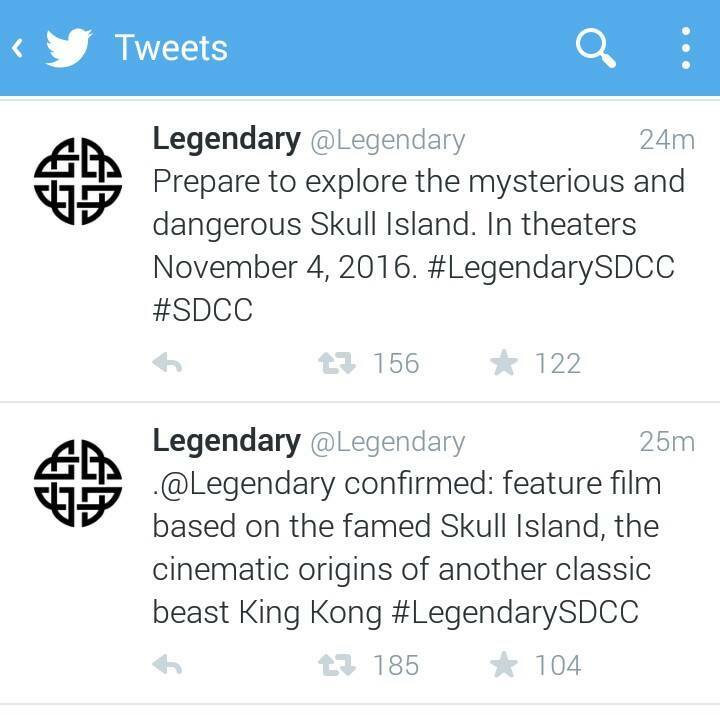 UPDATE 07/26/14: Looks like Legendary is bringing us a little film called SKULL ISLAND on November 4th, 2016 as well! Original article: Guys…. Its happening! I am all over the place with excitement right now! Legendary has confirmed via Twitter just who we will see in the sequels! Read on below the official tweets for more! What does this all mean, exactly? This sounds to me like we will be indeed treated to much of Toho’s most famous roster within the sequels at large – rather than cramming these three in the direct sequel. I would expect to see these guys peppered throughout a trilogy – Perhaps with Ghidorah coming in as the finale we’ve all been dreaming of? Think less of this as an announcement for a GMK type sequel, and more Legendary confirming that they’ve got the rights for our favorite Toho monsters to be included in all subsequent sequels. To me, that is an infinitely better scenario. It means we’ve got the possibility for an entirely new branch of US Goji films, all featuring both our favorite kaiju and brand new ones like the MUTOs! Apparently footage was screened as well, but nothing has turned up online yet – not even a description. We may very well see these three in a the second film, but only time will tell. If that’s the case, we may be getting a remake of Ghidorah, The Three Headed Monster! This is all absolutely incredible. I expected a tidbit of news, but this far exceeds expectations! I am still holding out for Anguirus, but only time will tell. More on this very soon! Let the speculation commence!!! Aw yeah! That news just broke Comic Con. Godzilla is instantly trending and it’s pretty awesome to see. I would have liked to see them all in one film to be honest, but I know that this way is more doable without having an incredibly large budget so that each Kaiju gets a lot of screentime. You sure they’re all going to be in different films though? Have you seen the CBM article on it? It seems to suggest that they’ll all be in the second film as per the teaser that they’ve shown. Either way, whether they’re all in one or spread out across the sequels, it should make for a really epic film. Next Post EXCLUSIVE: ‘Hail To The King’ Documentary is Funded! Help Make it Even Better! Previous Post X-Plus Ghidorah! Bandai! Blu Rays! It’s a Collector’s Update!